Jay McClelland is a Professor and Chair of the Department of Psychology at Stanford University where he also holds a professorship in the social sciences. He conducts research on learning, memory, conceptual development, decision making, and semantic cognition. 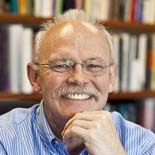 Over his career, McClelland has contributed to both the experimental and theoretical literatures in a number of areas, most notably in the application of connectionist/parallel distributed processing models to problems in perception, cognitive development, language learning, and the neurobiology of memory. He was a co-founder with David E. Rumelhart of the Parallel Distributed Processing (PDP) research group, and together with Rumelhart he led the effort leading to the publication in 1986 of the two-volume book, Parallel Distributed Processing, in which the parallel distributed processing framework was laid out and applied to a wide range of topics in cognitive psychology and cognitive neuroscience.